Swimming is considered to be one of the best forms of exercise as it works out every part of your body whilst putting minimum strain on your muscles. It is also however, a major source of anxiety for many ostomates who may worry about leakage or people noticing their bag. Here are some simple tips to take in order feel more comfortable taking a dip. Your stoma bag has been designed with water in mind and should be fully waterproof. If stickers come with your box, they can be used to cover the filter and stop it clogging in water. If you are the sort of person who likes cannonballing / diving in the pool, it might be a good idea to wear a snug bathing suit to help keep your bag in place. For men, drawstring trunks that are tightly fitted around the waist could do the job. You do not necessarily need bespoke swimwear although there are some on the market. Patterned fabrics are recommended as they make it more difficult to identify lumps, bumps and movement underneath. Try on your swimwear at home with your pouch, perhaps in the shower or bath so you can get comfortable with how it feels when its wet. This will also make you feel more confident that your bag won’t come loose (if properly fit). Many people wear a towel or beach wrap to conceal the area. A changing room is another source of anxiety. If you are concerned about getting changed in front of other people as they may notice your stoma/bag then try wearing a long shirt, or even draping a towel over your body. You could always change at home and wear clothes over your swimsuit too. There’s a natural tendency to worry that others will notice your stoma and stare. In truth, most people will not even notice the colour of your swimsuit, let alone what is underneath it. We hope these simple tips will encourage you to get down to your local swimming pool and get back in the pool. 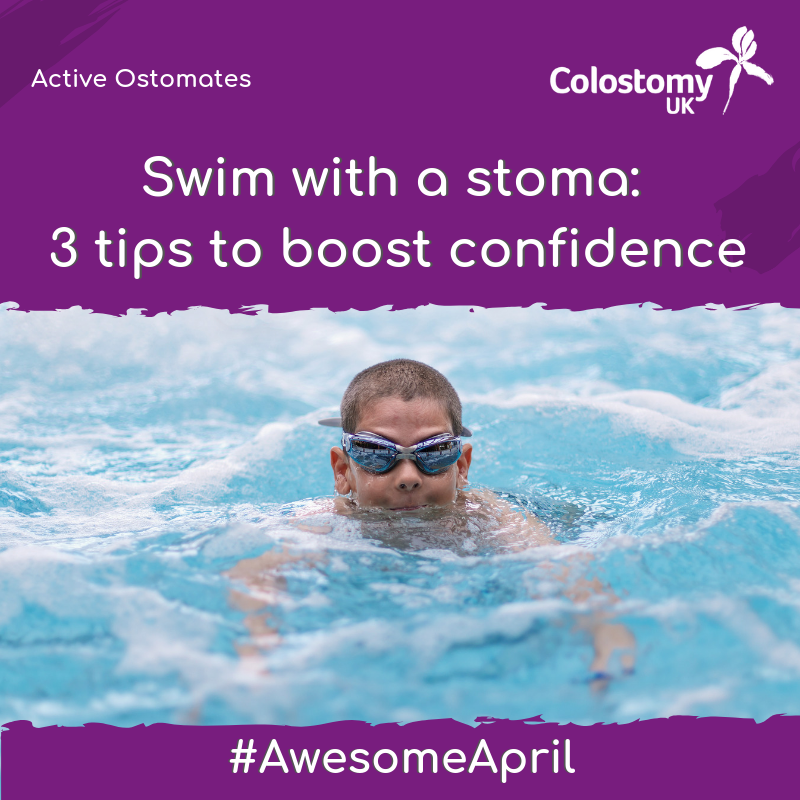 Our Active Ostomates project delivers free swimming sessions across the UK where we book out an entire pool and the changing room for Ostomates and their families.